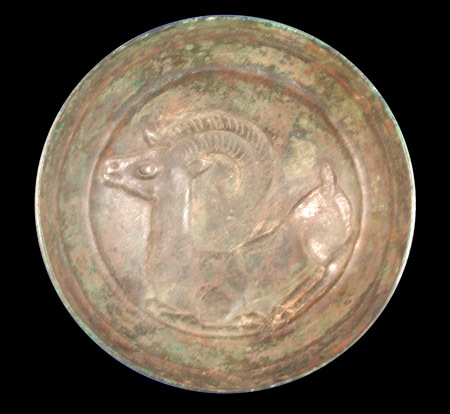 This finely crafted bronze bowl with a recumbent ibex centrally embossed is a rare and beautiful example of the Phoenician influence throughout the ancient world. 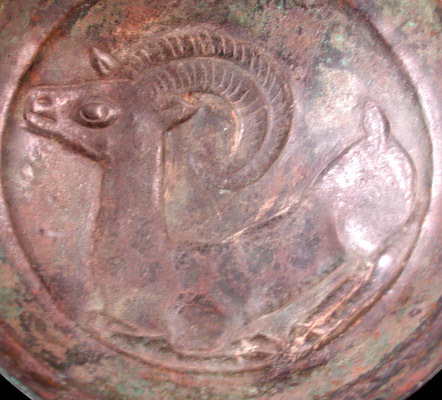 The inner surface of the round bottomed vessel is dominated by a well defined naturalistic reclining male ibex facing left with hoofed legs curled beneath it. The face is rendered in profile with a large almond-shaped eye with pupil and upper lid, incised mouth and nostril, and one perked ear. Both the ibexâ€™s large notched horns, typical to the male of the species, curl dramatically behind him tapering to pointed ends. Framing the ibex are three concentric embossed circles rendering a tiered effect to the bowl. The outer convex surface of the bowl is a reversed image of the inner designs. Attractive smooth emerald green patina over the entire surface of the bowl. 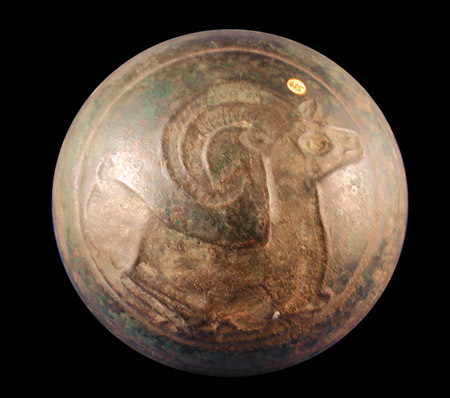 Bowls of this type are typified by a central embossed rosette encircled within repeating bands depicting animals and people, a design scheme heavily influenced by the Egyptians. 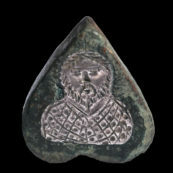 However, examples from Greece, Cyprus and Italy have been found embossed with animal scenes in place of the usual rosette as well as lacking the bordering friezes. A rare and highly desirable type. FOT Inv: 205.0086. 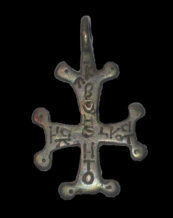 Condition: Intact with smooth dark green patina. Crisp detail. Provenance: Formerly in a French archaeologistâ€™s collection formed in the 19th Century. 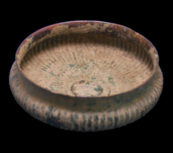 Background: Metal bowls of this sort rarely occur in the actual historical area of Phoenicia, but rather in the surrounding regions where their influence and presence had spread, such as Assyria, Cyprus, Greece and Italy.